BofA Merrill Lynch technical analyst MacNeil Curry notes today that investor sentiment toward gold is at its lowest level since November 2008. The bottom panel of the chart below shows the sentiment indicator (click to enlarge). 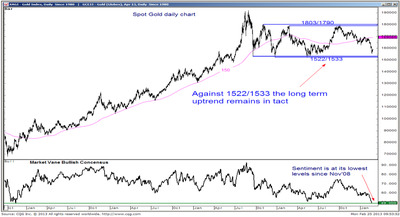 Curry, who is bullish on gold (BAML’s technical analysis team sees gold’s “longer-term upside potential into the $2100-2300 to $3000 range”) thinks the sentiment reading is a positive sign. While Gold has taken a significant hit as of late, it remains above the pivotal 1522/1533 17m range lows. Against here the larger bull trend remains intact. Note that sentiment has now reached its LOWEST LEVELS SINCE 2008. 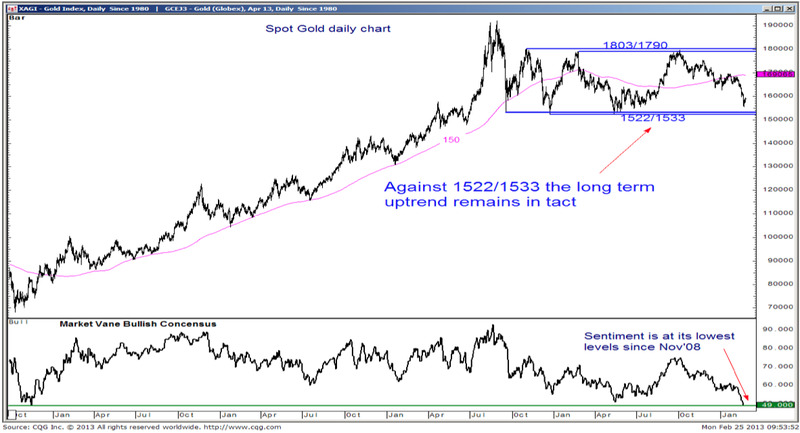 From the perspective of contrarian opinion analysis, a bottom and bullish turn in gold is close at hand. The sentiment indicator BAML tracks seems consistent with the latest CFTC data, which revealed that fund managers have placed their biggest bets against gold since at least June 2006.